Football, in which the university maintains its status as an independent university. It is a member of the Football Bowl Subdivision, and for postseason purposes Notre Dame is the only independent with the privileges granted to teams in the Power Five conferences. Men's hockey competes in the Big Ten. Their former hockey conference, the Central Collegiate Hockey Association, disbanded after the 2012–13 season due to a major realignment of hockey conferences. The Irish then spent three seasons as a member of Hockey East before joining the Big Ten. According to men's basketball Coach Mike Brey, Notre Dame seriously considered joining the Big Ten Conference in 2003, with the decision not to proceed occurring at the "11th hour." The school has a comprehensive and nationally competitive Division I athletic program, but it is most famous for its football program. Notre Dame fielded its first football team in 1887. 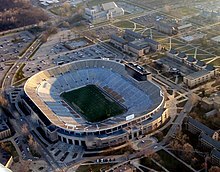 With eleven football championships acknowledged by the NCAA, over 800 all-time wins, seven Heisman Trophy winners, famous head coaches, a 73.6% winning percentage and the most consensus All-Americans of any school, Notre Dame football is one of the most storied programs both on the gridiron and college athletics in general. Recently, Notre Dame has struggled, going through several head coaches and setting the all-time bowl losing streak of nine straight with the loss to LSU in the 2007 Sugar Bowl before beating Hawaii in the 2008 Hawaii Bowl. Notre Dame is also the only football program in the nation, including both collegiate and professional ones, with every home game being on national broadcast television. The men's basketball team, coached by Mike Brey since 2000, has made 28 NCAA Tournament appearances and made it to the Final Four in 1978 under coach Digger Phelps. They are also known for ending UCLA's 88-game winning streak in 1974, a streak which had begun after Notre Dame had previously ended UCLA's 45-game winning streak in 1971. Notre Dame won the 2015 ACC Tournament and advanced to the Elite Eight only to fall to top-ranked Kentucky 68-66. The next year they would make another Elite Eight, yet lose to North Carolina. Notre Dame's women's basketball team is a perennial championship level program which has been consistently ranked in the top 5 in the country for the past 8 years, notching 8 consecutive 30+ win seasons. Coach Muffet McGraw has led the Fighting Irish to 25 NCAA tournament appearances including a current streak of 23 straight, winning two national championships and 8 Final Four appearances. The Irish won their first National Championship in 2001 by beating Purdue 68-66. The 2001 team was led by 6-foot-5 center Ruth Riley, a recent inductee into the Women's Basketball Hall of Fame. McGraw would take the Fighting Irish back to the Final Four in 2011, beating Pat Summitt's Tennessee Lady Volunteers; the program's first win against the Lady Vols in 21 tries. That win was followed by an upset of the number one-ranked UConn Huskies (making Notre Dame the first team ever to beat both Tennessee and UConn in the same tournament) to advance the Fighting Irish to the 2011 championship game, where it lost to Texas A&M. The Irish would return to the championship game in 2012, 2014, and 2015, losing to Baylor once and Connecticut twice. After an injury plagued start to the 2018 season, which saw four Irish players lost to injury, Notre Dame won its second National Championship in 2018 by beating Mississippi State 61–58. Guard Arike Ogunbowale scored the game winning three point shot with 0.1 seconds left, two days after scoring a similar buzzer-beater to knock out Connecticut in the semifinal game. The win was coach McGraw's second national championship and 800th career win. The Notre Dame men's and women's fencing teams have won 10 national titles — the men's team won titles in 1977, 1978 and 1986 while the women's team won the 1987 title. After the NCAA replaced the individual men's and women's national titles with a combined fencing championship, Notre Dame won national titles in 1994, 2003, 2005, 2011, and most recently, in 2017 and 2018. During the 2010 regular season, Notre Dame went undefeated in both men's and women's fencing. Notre Dame joined the Big Ten conference as sports affiliate member on July 1, 2017. They play along Michigan, Michigan State, Minnesota, Ohio State, Penn State, and Wisconsin in ice hockey. ^ "Gold and Blue". University of Notre Dame. Retrieved March 28, 2015. ^ Schlabach, Michael (April 7, 2010). "Kelly changing Notre Dame's focus". ESPN. Retrieved July 2, 2012. ^ ""Inside The Walls Of Arlotta" To Re-Air At 4:30 p.m. (ET) On Friday". Retrieved July 23, 2012. ^ O'Shaughnessy, Brendan. "What's In A Name? How Notre Dame became the Fighting Irish". University of Notre Dame. University of Notre Dame. Retrieved November 23, 2015. ^ "The Fighting Irish". University of Notre Dame. August 26, 2015. Retrieved August 26, 2015. ^ "Mike Brey was preparing to join Big Ten in 2003 / But Notre Dame basketball coach says Irish decided against move at last minute" Chicago Tribune, January 8, 2010. ^ "UND.COM – University of Notre Dame Official Athletic Site – Ice Hockey". und.com. ^ "Big Ten Welcomes Notre Dame Men's Ice Hockey as Sport Affiliate Member". July 1, 2017. Retrieved July 1, 2017. ^ "2008 Women's Soccer Media Guide". Retrieved April 8, 2009. ^ a b "eRugbyNews.com". eRugbyNews.com. December 31, 1969. Retrieved September 12, 2016. ^ ENR // AgencyND // University of Notre Dame. "About // Notre Dame Rugby // University of Notre Dame". Rugby.nd.edu. Retrieved September 12, 2016. ^ "Facilities". und.com. Retrieved December 7, 2018.